A superb book reminding us that the gospel is all about God. Note: The display and/or download of this book is for personal use only and it may not be distributed, duplicated, or used for any commercial purpose. 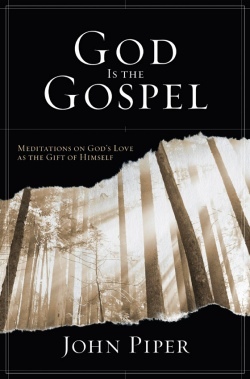 God is Gospel is a superb free Christian book written by John Piper that is available free to download. It currently has 4.5 out if 5 based on the reviews at amazon and has the subtitle of “Meditations on God’s Love as the Gift of Himself “. As with all of John Pipers books it is heavily rooted in the scriptures and focused on the cross. We can have a tendency to put a human touch on the gospel – that it is all about our salvation and us. Piper reminds us that actually the gospel is all about God. As well as the pdf book, there is also a very useful study guide at the Desiring God website, and also a Leader’s Guide. To get the free pdf download simply go to the Desiring God website at this link and then select the ‘Download this book (PDF)’ link. …the gospel is that God gives us himself—Christ died to give us Christ—, and this self-giving is his highest mercy to us and the best news for us! The most profound, most exceedingly gracious, final and decisive good of the good news is Christ himself as the glorious image of God revealed for our endless satisfaction. Have you read this book? What do you think about it? Why not vote or leave a comment? Please send me free books from John Piper to : 31 Winnington House, Wyndham Estate, London SE5 0XR. Stunningly written, deep, and profoundly affecting the innermost recesses of the heart. Can be read and re-read meditatively, pondered. Provoking the soul to yearn for ever greater closeness and comprehension of the Christ Whose face is the image of God. Short-circuits the devotion to inferior passions that consume even believers (especially in the prosperous western culture)…in favor of the apprehending greatest treasure of the universe, the most soul-enrapturing gift to mankind–God, Himself. Please send the free books from John Piper to God Almighty Church, Plot No:14,Vazeera Avenue, Road No:15, Venkateswara Colony,SAROORNAGAR,HYDERABAD,PIN 500035,ANDHRA PRADESH, INDIA. Please send me free books from John Piper to Teshie Aboma Presby Church P.o.box 285,Teshie – Accra. Please send me the free book of John Piper ~God is the Gospel,Counted righteous in Christ,Filling up the afflictions of Christ and What Jesus demands from the world. Please send me free books from John Piper to : APT BLK 455,JURONG WEST ST 42#07-132,SINGAPORE 640455. Beloved in Christ, Please I want you to assist me with Christian books by John Piper and an other authors. Mail to: Philadelphia Baptist Church, Box 2106, Lagere, Ile-Ife. Osun State. Nigeria. Please Sir/Madam,God bless you for the great work done.I have learnt alot from your site and i am really transformed but i don’t have much money to browse every week.I will be very grateful if you send me some of your books,audios and bible story videos to sustain my faith. Address to: P.O.BoxKN4138,Kaneshie-Accra.I am children and youth service teacher.Thank You. I am so glad to read these books in net. Would you please send me one/one copy of the book please? -50 reasons why Christ died.